Hey all! Do you have any idea how excited I am for this warm weather? ..and for summer? We went out of town again this past weekend and got to enjoy 90 degree weather. It was a blast :) While others here at home were left in the rain and 50's and 60's. Came back home, and it was 80 degrees. The heavens were shining down on us :) lol. I love summer. The only thing I'm not sure about is dressing the babe. She's a furnace like her dad, and I am an icebox. So....more times than not she's caught sweating cuz I think she's freezing since I am, so she must be, right?? Nope. So, more than likely she'll be caught just chilling in a diaper all summer lol. First, take your towel holder off the wall. 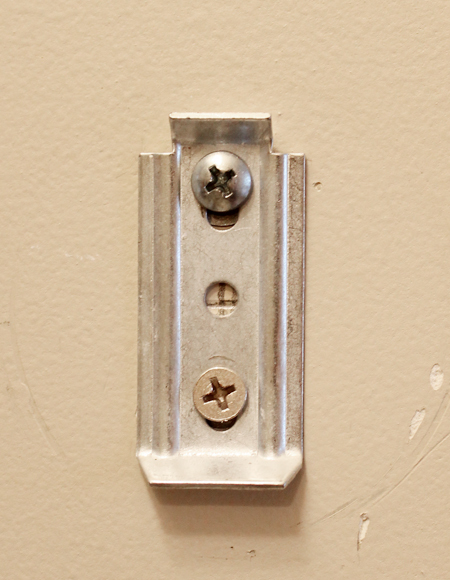 Usually they are secured with a little tiny screw, so just undo that screw with a little tiny flat head screwdriver. Now for the next steps. I compiled these all because there's a lot of steps :) See below the picture for the written out steps. 1. I took the paper that comes in the frame. I just used an ikea frame I had sitting around. 2. I folded the paper in half twice, so quartered it. Then took some scissors and cut out a small rectangle out of the middle. 3. I place the paper on the hardware to make sure it was the right size, not too big, and not too small. 4. I then traced the paper size and middle cut out piece onto a piece of fabric. 5. I folded the fabric into quarters. 7. I secured with glue the fabric on top of the piece of paper, just to give the fabric some stiffness. 8. Lastly, I secured the fabric/paper onto the frame with some tape. And then...I placed the frame onto the hardware, secured the frame to the wall with a nail, and then placed the towel holder back onto the hardware and screwed it back on. I decided to make the whole thing cohesive with using the same fabric that I used for the curtains for the middle of the frame. I love how it ties everything in :) I also love that I don't feel like I have to put a picture around this area anymore. You can also just secure the fabric to the wall and then get some molding and place it around it. Make it whatever size you want! 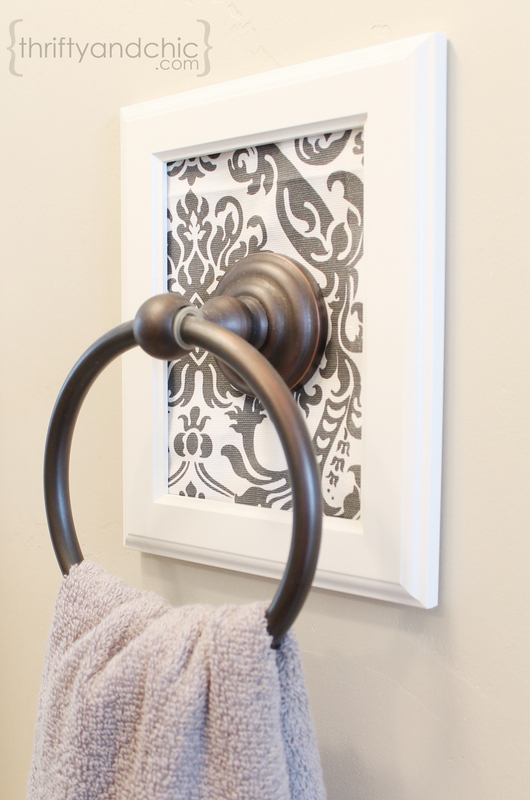 Or get an oval frame and do this. That would be awesome :) Especially if it was super ornamental. Have fun! Perfect! Just enough in that spot without being too much. I feel a mini-project coming on! This is such a great simple idea that packs a huge creative punch! I'll have to try this one day! I tried this and my fabric looks bunched up a little any suggestions would be helpfull. Yours looks perfect! I used a pretty thick fabric so that may have helped. 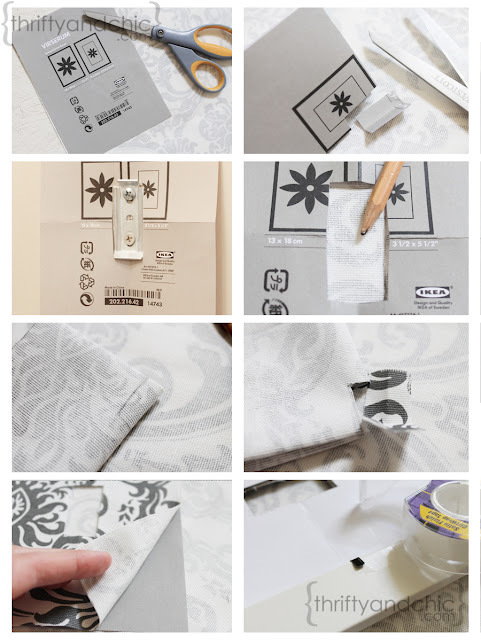 If you still have problems, maybe try using double sided tape to tape the fabric onto the wall. That is a really great idea! I may try your idea over a TP holder... Thank you for sharing! Hello. I have brick walls not plaster board. 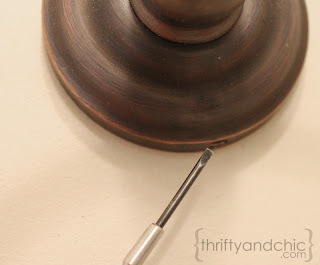 How would I attach the frame flush to the wall? How did you secure the frame to the wall with a nail? This is an awesome idea! 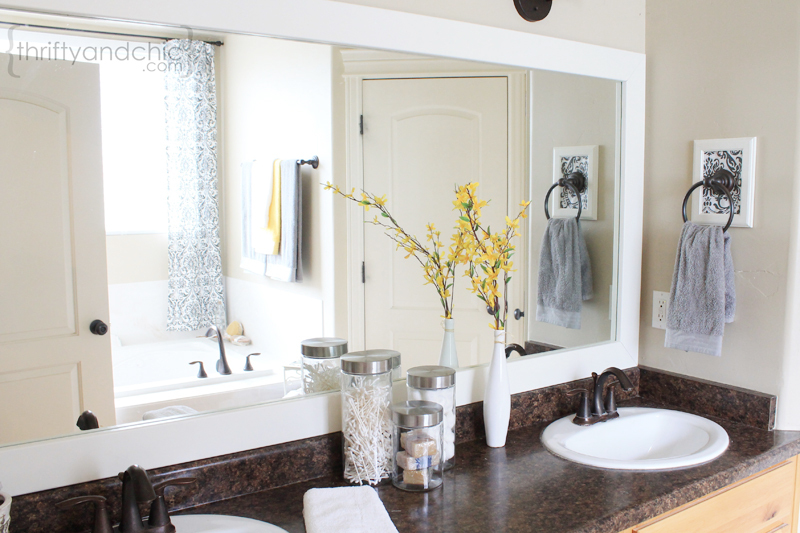 I'd like to know what the wall/paint color is -- I really like it! 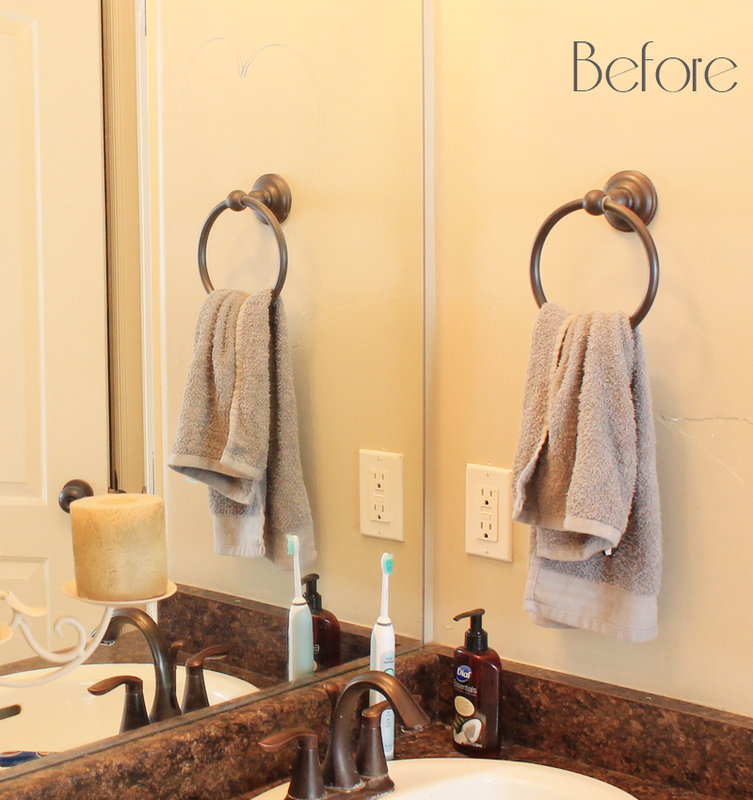 Such beautiful DIY makeover. Think i could have a try at this. 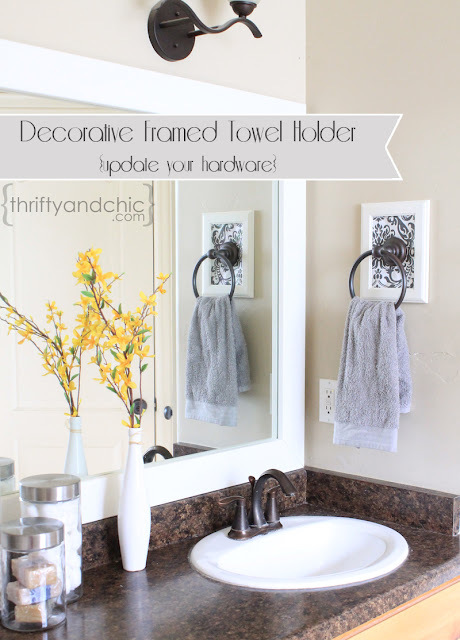 Love this towel holder.